SPONSOR INFO - Welcome CABOHOLICS! The 5th Annual Caboholic Convention is right around the corner! February 6th – 13th! ​The annual Caboholic Convention is a not for profit event. and benefit a few of many charitable organizations in the Los Cabos community. Your support is greatly appreciate! Local Businesses in the tourism industry are invited to participate in one of three sponsorship levels. It's easy, just download and print the form. Return it either in person at the Caboholic Store, along with payment or you can email the form to maddie@caboholics.com and pay via paypal at the button provided no later than January 29th to insure you don't miss out! 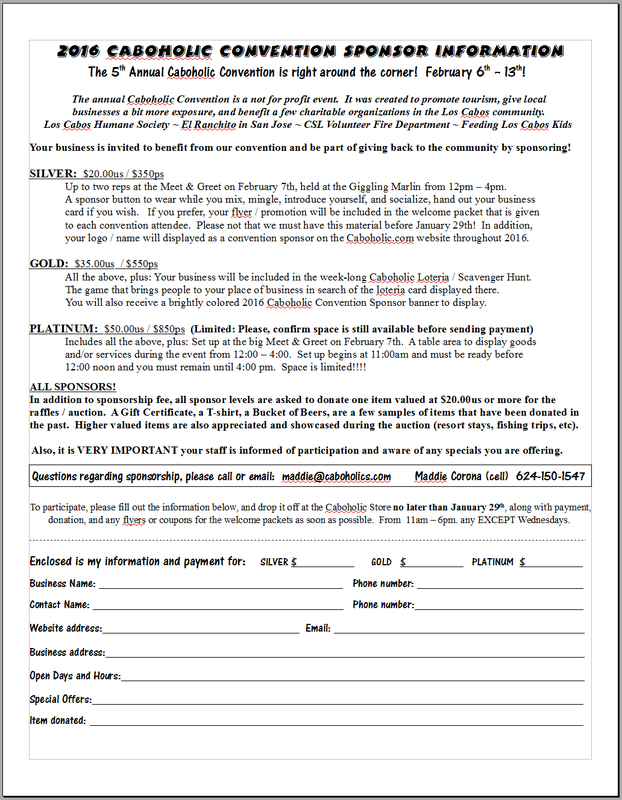 Click on the following PDF file link below to download and print a business sponsor sheet. ​to fill out the form. ​Payment may be made via Paypal or in person at the Caboholic Store. There were no plans or expectations for individual sponsors this year, and the interest shown by individual members after a link for sponsorship was partially set up with no details or information took me by complete surprise! Since most of the individuals who chose to sponsor are not Cabo locals, and could not possibly benefit from what we offer to the business sponsors. I've been trying to come up with what we can offer in return for their generosity, loyalty, and support. AND - A special limited edition plastic Caboholic keychain! In addition to all the above, my sincerest thank you for your support and friendship. It's the surprises like this that remind me of how very fortunate I am to have so many friends who's kindness, sincere goodness, and consistent willingness to help never cease to amaze me.